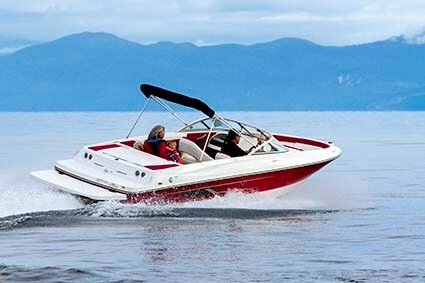 The latest Bayliner 195 Bowrider gives you wind-in-your-hair freedom and will see your kids having the time of their lives. 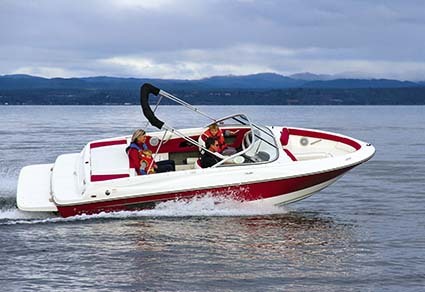 Although the Bayliner 195 Bowrider is specifically designed to offer the maximum amount of boat that can be squeezed into an average-sized garage, Bayliner hasn’t sacrificed functionality or fun factor in the pursuit of its cause. 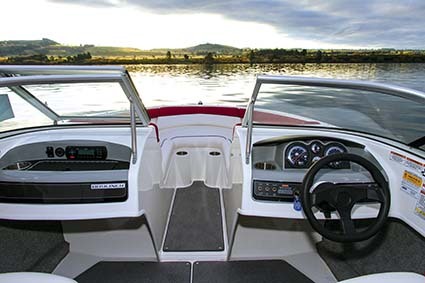 The new generation 2014 Bayliner 195 Bowrider is not only assured to put a smile on the kids’ dials but should also appeal to mum – while not making the bank manager too nervous either. 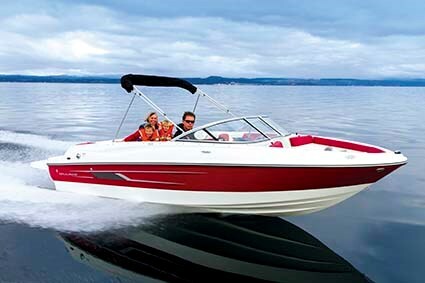 Our test subject is one of three new-generation 2014 model Bayliner boats. To my boat-crazed mind, bowriders are all about family fun, so when the test was booked it seemed a shame to not make the most of it. While a tight weather window ruled my young kids out of tagging along for a blast on the lake, local brothers Jesse (7) and Michael (4) Hodgson had been pleading with their parents to ask someone with a boat to take them out for some time. It just so happens their wish came true, thanks to Judi Smith and her friendly team at Lakeland Marine. The boys first got to try the Bayliner 642 Overnighter on for size before stepping across to the shiny red and white Bayliner 195 Bowrider for a second dose of fun. We started the test by giving the 190hp MerCruiser plenty of gas and put it through a few tight turns for the photo shoot. Despite it being their first time ever on a boat, the boys couldn’t stop smiling. Four-year-old Michael made the comment afterwards: "That was awesome! Can we go again tomorrow?" While elder sibling Jesse was already putting in his order for Christmas. 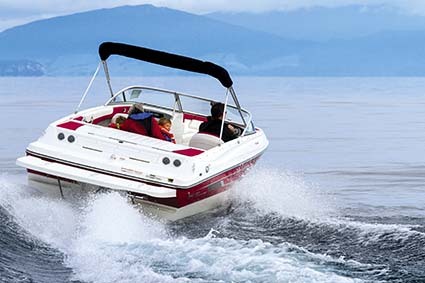 Of course, it’s not much good loading the boat up with fun-lovers if there’s nowhere to stash their stuff but the Bayliner 195 has multiple compartments designed for just that. 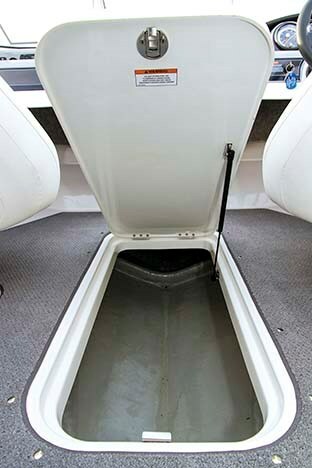 Skis or a wakeboard can be safely stowed in the under-floor locker, with further storage below the transom bench seat – just add ice to chill the drinks. There’s also under-seat storage in the bow, with further carpet-lined compartments behind the backrests. I find there’s nothing more annoying that a ratting catch, so Bayliner fits magnetic catches with Velcro on top for good measure. 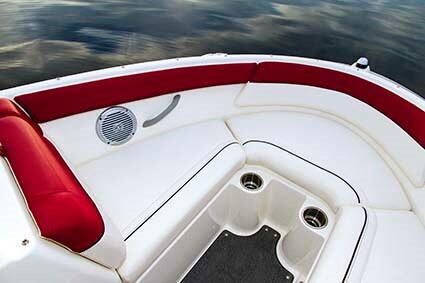 On top of all the storage are a few little touches throughout which show Bayliner has given a lot of thought to both fitout and design. 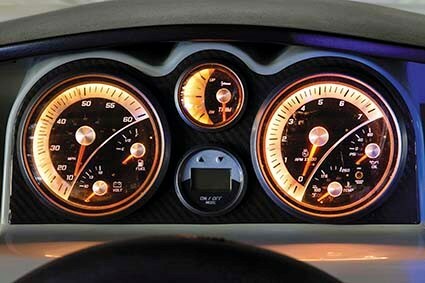 Such as a special bin beside the engine to warm the wetsuits or help dry the wet gear afterwards. 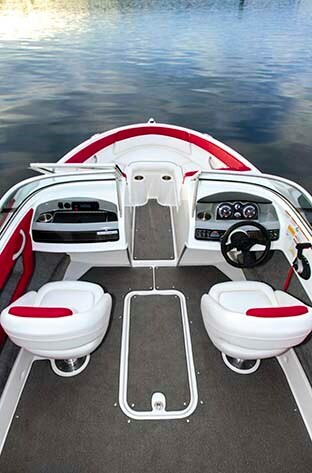 Clip-in carpets and the fibreglass floor liner hiding below, offer versatility and comfort – carpet in for cruising or out for fishing and/or getting wet and wild with the water toys. There’s plenty of space to lounge about on the large rear sunlounge and extended swimplatform with easy access for making a splash. Your toes won’t have any run-ins with the boarding ladder as it’s safely tucked away underneath. A grabrail on the transom is on hand to help with getting back on board afterwards. The standard towing eye will also come in very handy. 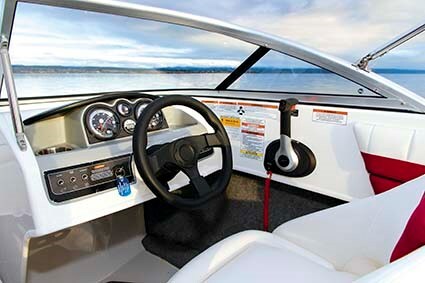 Wherever you sit are a cupholder and grabrail in reach, while the recessed glove box lid and further helm compartment allow an easy-dump zone for pocket-dwelling items. Dad can even reach around to open the under-floor locker (complete with a gas stay) from the helm without having to leave his seat. The standard mid-ship cleat is also nice and handy to the helm, to help with docking without arguments. While our test boat had the lowest horsepower engine option, the 190hp 4.3lt carburetted TKS MerCruiser still had plenty to offer, topping out at 41kts at WOT and getting there in sporty fashion. 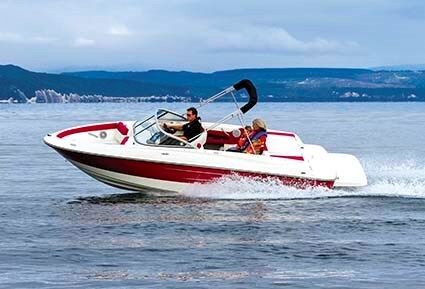 That speed is more than enough to thrill the kids or blow out the cobwebs after an overdose of work, but the 195 Bowrider will also handle 260hp if you feel the need for more speed or companions. Bayliner’s performance figures show 45.6kts at WOT and a 26kts cruise with the 260hp 5.0L ECT MPI and 44kts at WOT and a 21.6kts cruise with the standard 220hp 4.3L ECT MPI. 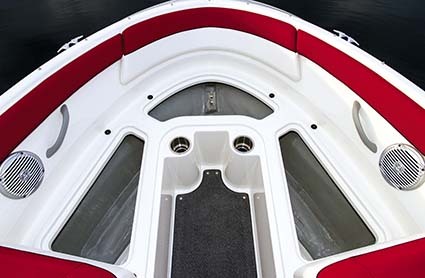 Bayliner’s foam-filled hull and attention to soundproofing provided an audibly-pleasing glide, while the hull and props hang in tight and turns the boat with ease. At my tall height, eye level was right on the top of the windscreen frame, but the simple solution is to relax farther back into the comfy helm seat to enjoy a good view. The bolster also allows you to comfortably sit, looking over the top with the freedom of wind in your hair. All passengers rode in safety thanks to the well-mannered and soft-riding hull design, high gunwales and handrails where you need them. 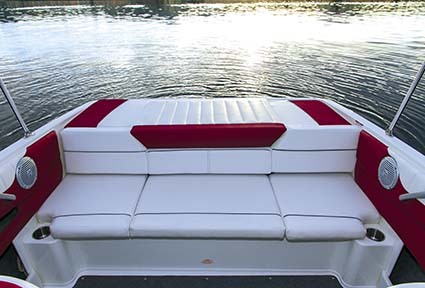 Our test boat had the optional Sports Seating arrangement, featuring a large bench seat across the transom, which comfortably caters for three adults or four kids. 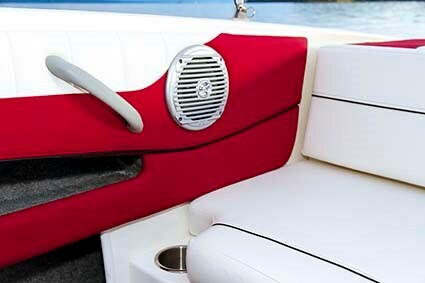 Both of the relaxing helm seats swivel to face the rear, with bolsters fitted for enhanced comfort and versatility. After being onboard this family fun machine I can appreciate the reason Bayliner have been around since 1957 – they build high-quality, safe, affordable and attractive boats with performance to match. As tested, it’s a value-for-money memory maker with plenty of options fitted to entertain the family. Of course the beauty of being able to keep it in the garage is if the weather’s foul you can still sit on the boat, crank the stereo, enjoy the comfort, utilise the cupholders and dream of the next adventure. See the full version of this review in Trade-A-Boat #243, July / August 2014. Why not subscribe today?